Receiving service for essential machinery or equipment from various service providers? 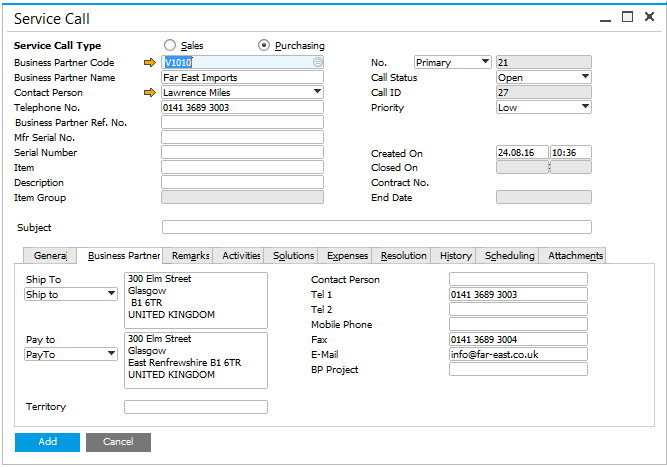 You can manage and document it using the Service module in SAP Business One. The service module is enhanced to support creation of service calls for vendors, assignment of equipment cards to vendors and allocate service contracts to vendors. The service module reports are also adjusted to include data related to vendors. Available since SAP Business One 9.2, version for SAP HANA and SAP Business One 9.2. For more information please contact Mark Burt at mburt@d1tech.net.